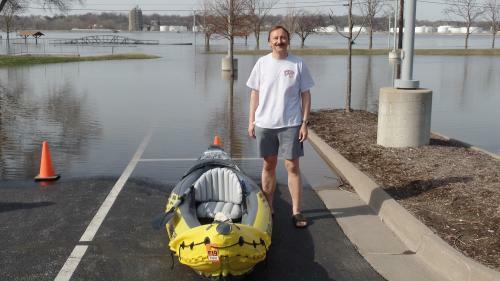 WIU Assistant Professor of Management and Marketing Vitaly Brazhkin is pictured after kayaking near the WIU-QCs campus. Professor Roger Viadero, director of WIU’s Institute for Environmental Studies, is pictured measuring the depth and speed of flood waters in front of WIU’s Quad Cities campus April 2 (left) and April 7 (right). Photos by Anshu Singh (left) and Roger "Spike" Viadero, III (right). 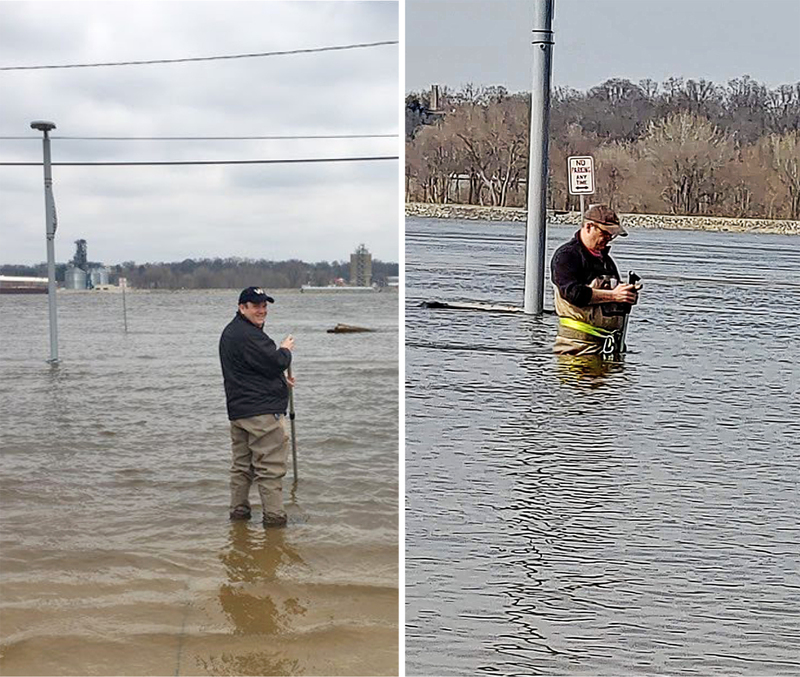 MOLINE, IL -- The Mississippi River has always been right at the front steps of WIU's Quad Cities campus, but not literally. Although the flooding presents challenges to the community, WIU-QC professors are using this opportunity for educational purposes. 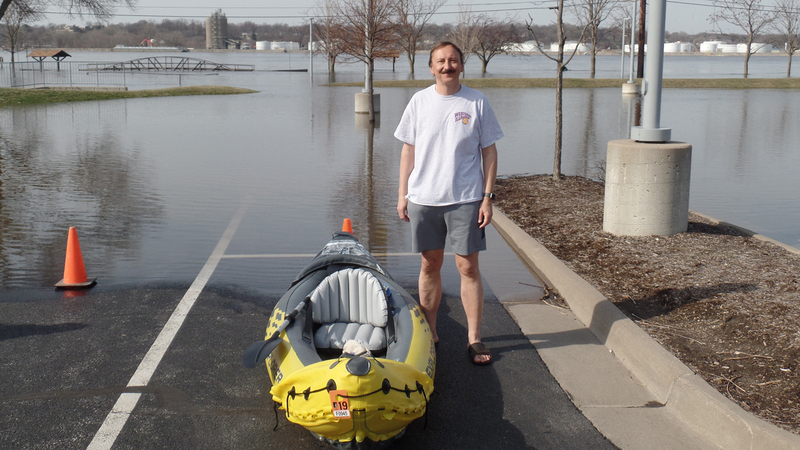 According to Rob Porter, a recreation, park and tourism (RPTA) professor at WIU-QC, the river and the flooding are a great object lesson on how flooding occurs and how land resources can be managed to accommodate flooding and promote healthy recreation. Students are able to see how low lying floodplains without levees allow the river to flood horizontally, which alleviates vertical flooding. With levees and other flood control structures at work, the flooding occurs vertically. This is important in the context of recreation and resource management to manage adjacent land to accommodate horizontal flooding rather than block the water out exacerbating vertical flooding. Examples of this can be found just outside the QC campus buildings. Ben Butterworth Parkway, the multi-use trail, the lawns on campus and detention basins are designed to withstand periodic flooding. There is little infrastructure that can be damaged; the surfaces (grass, cement) are durable and only required a bit of clean-up after a major flood. This is also the case in downtown Davenport, IA. By designing and managing riverfront land as parks to accommodate flood waters, the need for levees is removed, decreasing vertical flooding and increasing outdoor recreation opportunities. Another WIU-QC faculty member who has used the flooding as a learning opportunity is environmental studies Professor Roger Viadero. 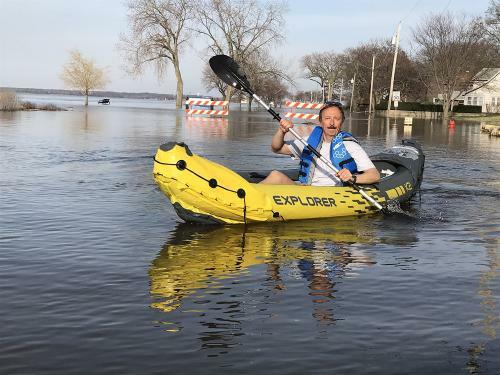 As flood waters rose to cover River Drive in Moline, he and Anshu Singh, a doctoral student in WIU's environmental science program, geared up to track the depth and speed of water in places that are rarely ever connected to the river. For example, on April 2, they headed out to measure the depth and speed of water at the curb in front of the WIU-QC campus. The flood water was 12 inches above the curb and had a surface speed of 1.1 mph. Five days later, the water was 34 inches deep, with an average velocity of 1.8 mph. As a point of reference, according to the National Park Service, the average surface speed of the Mississippi River ranges from 1.2 mph at its origin to around 3 mph in New Orleans, LA. Viadero also placed pins in the ground to mark how far flood waters extended onto the campus. Once the flood waters recede, Viadero and his students will survey and map the pin locations for comparison with any future flooding events. "We know the Mississippi River is a great asset of the Quad Cities region," said Senior Vice President for Strategic Planning and Initiatives Joe Rives. "Its natural aesthetic is a recruitment device to our University and is a wonderful teaching tool. In planning the campus, we knew that there would be times requiring flexibility, as the campus is built on the 100-500 year flood plains. We are thankful to former congressman Lane Evans for securing the funding leading to the construction of University Drive that keep the campus open during time of significant flooding. We also built the campus with flooding in mind through installation of retention basins and indigenous plantings that would live through flooding. These are also linked to our academic programs."